I have been busy these last months selling my business, organizing and preparing my large astrological library for its permanent home at the University of Illinois, sorting through and shipping out many thousands of dharma tapes that I have been holding and collecting, cleaning out basements, and retrofitting our audio and video studios. I have had little time for photography, but the smoke is beginning to clear and photography is rearing its head again. For me close-up and macro photography is more than a hobby. It is a meditation discipline as well, one that I have carefully honed for many years. Meditation has no "right" object, so anything we love and care about will do. Plants, flowers, and the outdoors fit this category for me. They always have. 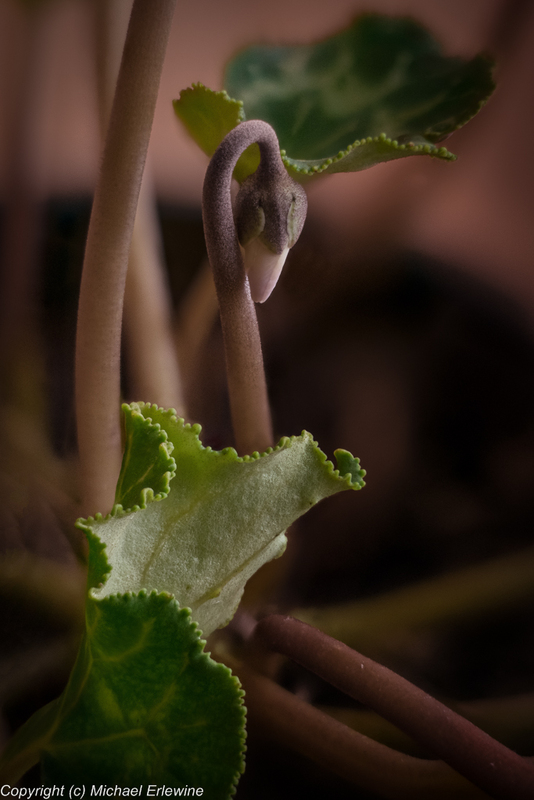 Here is a shot taken a day ago or so of a young cyclamen flower.